Take the Expressway South (Route 93) to Route 128 North. Stay in the left lane on Route 128 and take Exit 4 (Left exit) to Route 24 South. From Route 24, take Exit 19B (Central Street). Turn Right at third Stop Light (Turnpike Street). 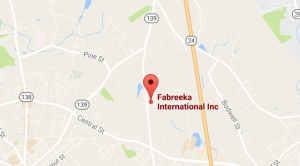 Fabreeka is about 1/2 mile on the Right in the Stoughton Corporate Center. Take Route 95 North to Route 128 South (toward Boston). From Route 128, take Exit 4 to Route 24 South.